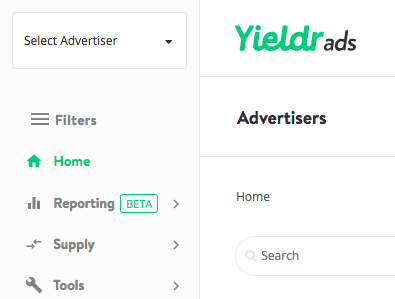 The Yieldr Ads platform is connected to more than 50 SSPs giving you access to valuable supply for your campaigns. Most of the SSPs we are connected to offer private deals and marketplaces which you can negotiate yourself. If you need more information on which SSP offers deals please contact support@yieldr.com. 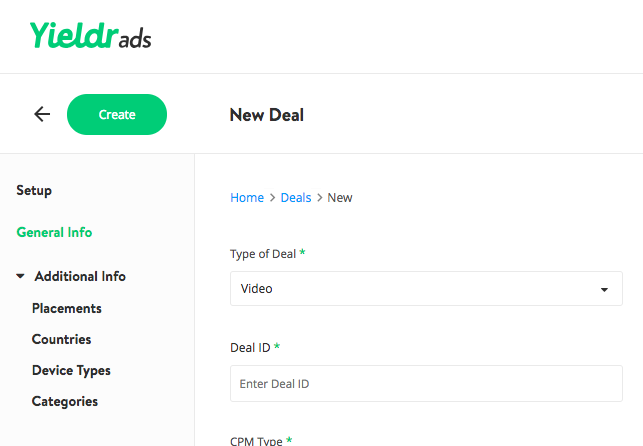 After you have negotiated deals for your advertisers, you can enter them into the Yieldr Ads platform yourself. All deals which you negotiate and set up are only visible to you and your clients. Note: We can set up Google client accounts in our Google seat for you, please contact support@yieldr.com if you are interested. Note: Deals for Bidswitch SSP need to be additionally set up in Bidswitch. Please contact support@yieldr.com for this once you have set up your deal in Yieldr Ads. 6. Fill in all required fields. You will see more explanations in the next steps. 7. Under "type" or "deal" you can find a list with the most common deal categories. This will be useful when you are using the search function to find relevant deals. 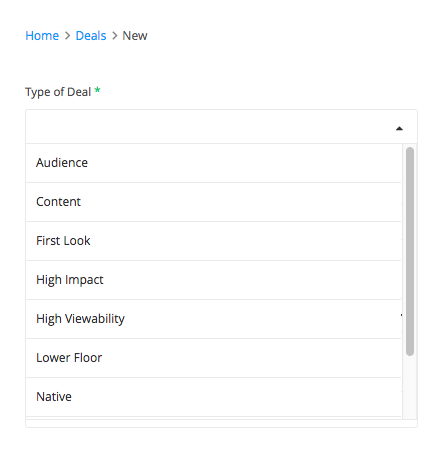 Audience - Deals with specific segments set up by the publisher. Content - e.g. channel deals which include only selected inventory. First Look - Deal with higher priority (i.e. preferred deal in Google). High Impact - Used for sizes such as 1800x1000, 970x1000, etc. High Viewability - Used for deals which guarantee a certain % of viewability. Lower Floor - Deal with lower floor price, usually associated with revenue commitment. Native - Deals for native formats. Rich Media - Formats such as expendable, sliding skin, etc. Video - Deals preroll, midroll, postroll formats. 8. 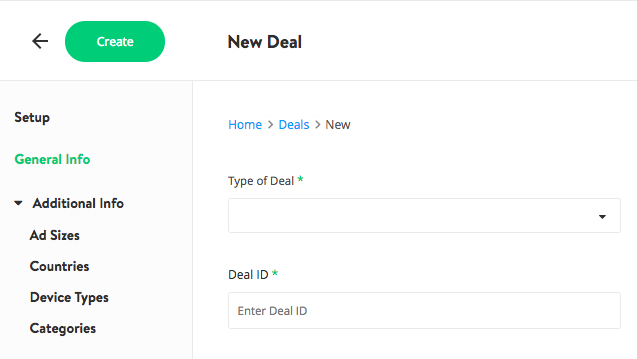 Enter the deal name in the "Description" field. 9. Enter the "Deal ID", the "Publisher’s Name" and the "Publisher’s ID" (the last field is not mandatory). Note: Selecting the wrong SSP will affect bidding behavior. 11. Select the "Currency", under "CPM Type" select either "Floor CPM" or "Fixed CPM" depending upon the deal and add the "CPM". If applicable, add the "Scheduled End Date". 12. Set the deal to "Active" in the top right corner. 13. Navigate to "Additional Info" and complete the information required. All fields are mandatory, but self explanatory. Note: Adding a wrong ad size will affect bidding behavior. 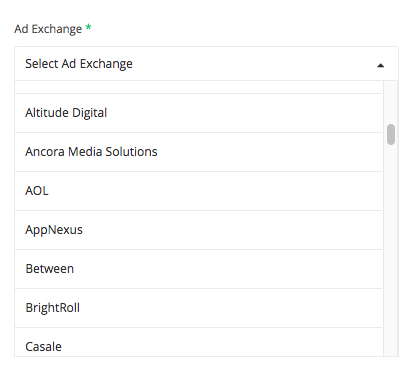 There is an exception to the "Ad Sizes" field when "Type of Deal: Video" is selected, please see the next step for more details. 13A. In the case of a video deal "Ad Sizes" gets replaced by "Placements". 13B. In the "Placement" category you can now select the correct video type for your deal. 14. Now click "Create" and you are done! Important Note! You need to target you deals on campaign level!